The Ham House is located in Ham Richmond-upon-Thames. In addition to the house, there is an orangery, icehouse, still house and dairy. This grand house was built along the Thames in 1610 for Sir Thomas Vavasour, who was the Knight Marshal to James I. When Sir Thomas died in 1620, the house was occupied briefly by the Earl of Holdernesse before being given to William Murray in 1626. Murray was a close friend of King Charles I. He was later created 1st Earl of Dysart for his loyalty to the Royalist cause. When he died, the house was passed on to his oldest daughter, Elizabeth as was his title and she was named the Countess of Dysart. Many described Elizabeth as beautiful and smart, but she was also ruthless and greedy. It was said that even while married to her first husband, Sir Lionel Tollemache, 3rd Baronet, of Helmingham Hall in Suffolk, Elizabeth was seeing her future husband, John Maitland, 1st Duke of Lauderdale. The two eventually married after her first husband’s death, and Duchess Elizabeth had Ham House remodelled and made larger. However, when the Duke died, she was forced to sell much of her stuff before she died in 1698. The house then passed to her oldest son Lionel Tollemache, 3rd Earl of Dysart. His heir, Lionel the 4th Earl, did more remodelling in the 1740s. The 5th Earl had the garden relandscaped and the 6th Earl tried to enhance the 17th century character of the home before his death in 1821. However, by the time William, the 9th Earl, acquired the house in 1884, it was deteriorating. He put on a new roof, installed electricity and heating, and had the furniture from the 17th century restored. After his death in 1935 the house was passed on to his second cousin, Sir Lyonel Tollemache. Sir Lyonel and his son Cecil decided to give the house to the National Trust in 1948. The home is now used for guided tours, events (such as open-air theatre), and country walks. "There is a ghost at Ham. The old butler there had a little girl, she was then six years old. In the small hours of the morning, when dawn was making things clear, the child, waking up, saw a little old woman scratching with her finger against the wall close to the fireplace. She was not at all frightened at first but sat up to look at her. The noise she made in doing this caused the old woman to look round, and she came to the foot of the bed and, grasping the rail, stared at the child long and fixedly. So horrible was her stare, that the child was terrified and screamed and hid her face. People ran in and the child told what she had seen. The wall was examined where she had seen the figure scratching, and concealed in it were papers, which proved that in that room, Elizabeth had murdered her first husband to marry the Duke of Lauderdale." House steward Victoria Bradley has seen footprints at the bedchamber of the Duchess. After turning on the light, she said she saw footprints by the bed, facing the fireplace. Bradley has worked at the steward for seven years and has lived in Ham House for the last three years. There have also been footprints seen on the staircase. Others who work at the house have reported smelling pipe tobacco in the dining room. Anne Partington-Omar, the manager of Ham House, who also lives there says there are things that happen there that just cannot be explained, such as the footprints. It is said that the Duchess walked with a cane at night. Many people report hearing tapping in the corridors at night. 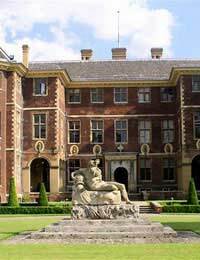 Some have even reported seeing the ghost of a dog – King Charles’ cocker spaniel – on the grounds of Ham House. Like many older homes, Ham House has a long history, with some of its inhabitants having questionable character. Each Halloween, the Ham House offers ghost tours in search of the evil Duchess and the playful ghost dog.